I was initially picturing Al as an ambivalent character trying to evoke in his music deep issues and emotions related to Middle Eastern cultures, but not without a certain self-depreciating sense of humour and a questionable taste for stereotypical arabesque harmonies. On a personal level, I’m from a family who is half-French, half-Armenian (from Turkey). I grew up with this sort of historical ambivalence in mind, born and bred in the relatively untroubled French culture but not completely oblivious (how could I?) of the troubled past of my modern Armenian ancestry who had experienced the first genocide of the 20th century - which as you may know some people and countries still deny its very existence as we speak now in 2018. So, instead of doing something purely on my personal history and origins, I just wanted to celebrate/acknowledge the modern history of the both fascinating and chaotic Middle Eastern cultures. 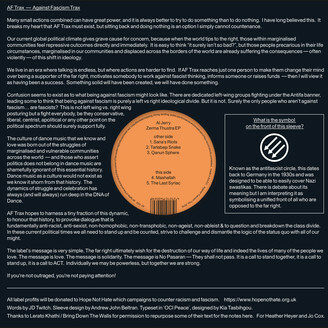 AF Trax = Against Fascism Trax and is a new label project instituted by JD Twitch/Optimo Music. Its aim is to make a musical and cultural protest in opposition of rising far right politics and ideology in the world. Encouraging artists to make music intended to interrogate these toxic ideas, and with all label profits donated to Hope Not which campaigns to counter racism and fascism. Against Fascism Trax’s intent is to provoke conversation, inform and financially support the opposition to fascist thinking. Its simple idea is that we must do something more than just talking. The moral thing to do is to act.